Now, I like cake. I don’t think I know anyone who doesn’t. Cake is one of life’s fantastic luxuries. It’s never a bad time for cake and it goes with pretty much any meal, snack or beverage. It’s like the friend everyone has who is always up for a beer no matter what day of the week it is. And like that friend, you’ll always end up consuming far too much, feel sick and regret it the next day as your gut grows steadily larger. But you’d do it all again in a heartbeat. Assuming it still beats after troughing a mountain of chocolate fudge. Those of you who are regular readers of Polyhedron Collider will have probably understood that I have a dark sense of humour and I’m not exactly averse to the odd inappropriate metaphor or two. So it’ll come as no surprise to you to learn that I quite enjoyed the Portal video games when they were doing the rounds, generating more jokes about cake than the workers of a Mr. Kipling factory on April Fools day. I even made a video review of the second game back in Days of Yore sometime between the discovery of fire and the world finding out granting wishes wasn’t the only thing that Jimmy Savile did to children. Obligatory cake statements out of the way, I should probably concentrate on the game I’m here to cover and start talking about Portal: The Uncooperative Cake Acquisition Game. Being a fan of the video games, I had my eye on this one for a long time, but found it to be eye-wateringly expensive. Once the price dropped below something resembling the GDP of Zambia, I bagged it and prepared myself for some orifice penetration with only a cube as a companion. Given the pedigree of the subject matter, this is a heck of a standard to live up to so you can appreciate the level of expectation I carried when opening the box for the first time. Even in my natural role as a cynic, I was disappointed when the lid came off, although not at first. Presented with a huge bit of card pointing out an incinerator, I thought “great, they’re sticking to format”, perhaps a little too closely given Portal’s minimalist looks as the contents beyond that are very meagre indeed. 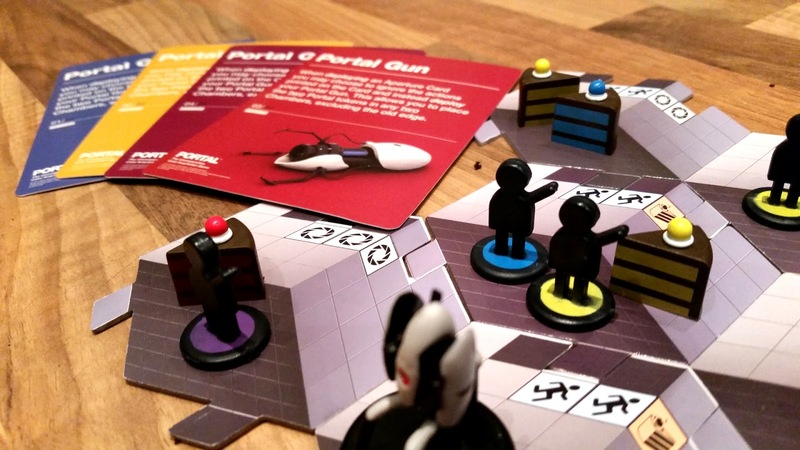 It’s a 2-4 player game – each player receives a portal gun card, 8 test subjects and 8 slices of cake. Beyond that are 18 board pieces, a companion cube miniature, a turret miniature, a GlaDOS standee and a small deck of character cards. That’s it. So I felt a bit cheated right from the off. On the plus side, the game does capture the feel and look of Portal very well indeed. It’s very familiar and it looks like the short Aperture Science videos in Portal 2 – I could even hear Cave Johnson in my ear as I played. So at least we’re in the right frame of mind. 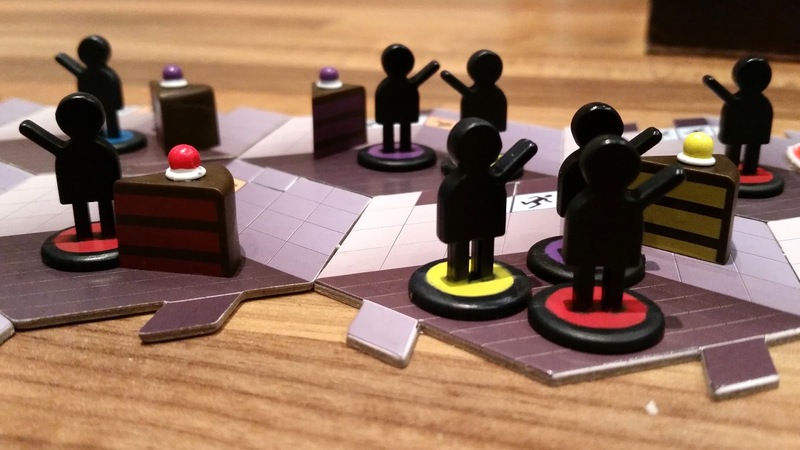 The aim of the game is simple – have more cake in play than anyone else at the end of the game. Getting to that point is the fun bit and the “Uncooperative” part of the title really shines through as you screw your opponents over at every opportunity. 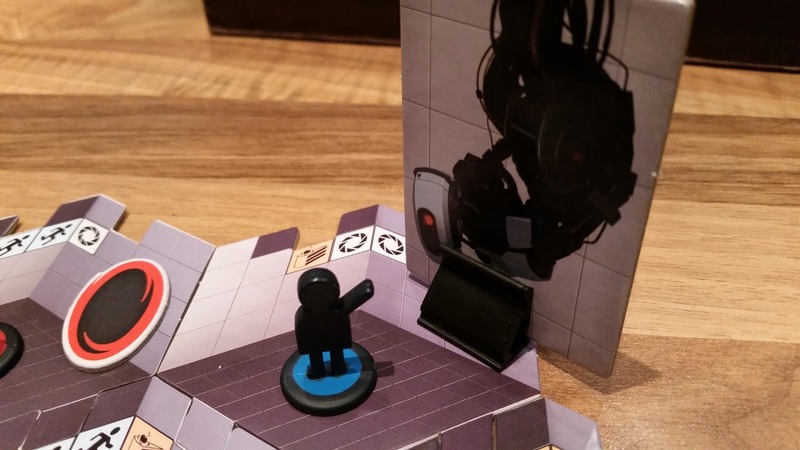 Portal sets up well – you form the test lab from 15 double-sided chambers (interlocking hex tiles) which is in a fluid state – the board reconfigures every turn. 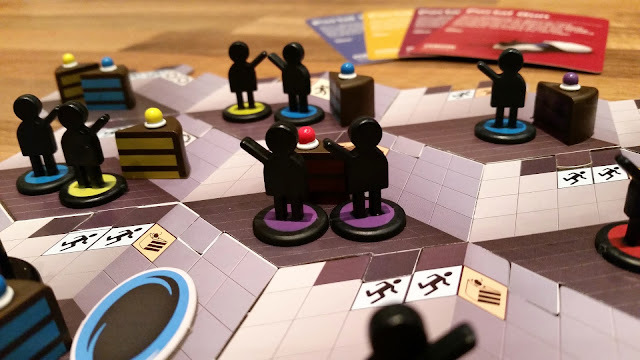 Your test subjects move around the lab in order to activate their properties and gaining either more subjects, more cake or enabling the Cube or the Turret. Chuck in the odd aperture card to activate certain effects and watch the chaos unfold. You start at the new end of the lab and “old” chambers are activated, and then recycled so anything in them is destroyed, cake and all so it’s a race to get cake, then preserve it. Test subjects are expendable, cake is permanently destroyed. When the chamber is recycled, it’s flipped over then placed at the “new” (left-hand) end of the lab so the result is everyone is on a sort of conveyer belt. So it’s a very self-serving game and it’s quite aggressive, tense and tactical. Which I must admit is great. I love it. However, I have a lot of issues with Portal – not so much how it works, but the way certain elements are used, GlaDOS being my main complaint. She’s in charge of the lab and her only use is to signify which chamber is being activated then recycled – a function that’s perfectly suited to a single working finger. So Cryptozoic have reduced one of the greatest antagonists of all time to something less functionally equivalent than a nose-picking device. Not only that, they didn’t even make her a miniature, which I feel aggrieved by. The thickness and quality of the board tiles also leaves something to be desired – considering they’re moved about often, they aren’t very durable. Even by my 4th play through, the tabs had started to show signs of wear. They’re not very thick (approx. 2-3mm) and they don’t interlock very well either. Considering the price of the game, the quality of the components isn’t good enough especially as there really isn’t much to the game. 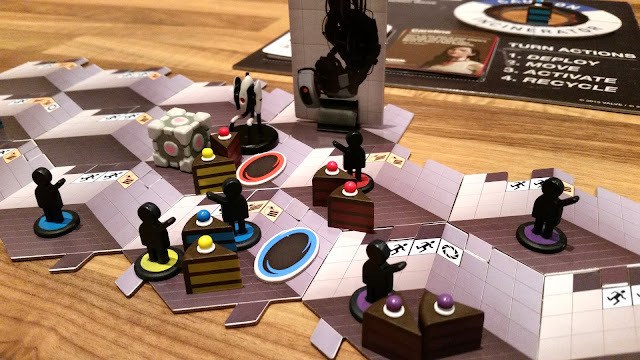 The test subjects, cake slices, turret and cube look great though, so it seems a little inconsistent. Almost like the budget ran out and they were forced to shoehorn in GlaDOS and the tiles somehow. So I’m left in a quandary. 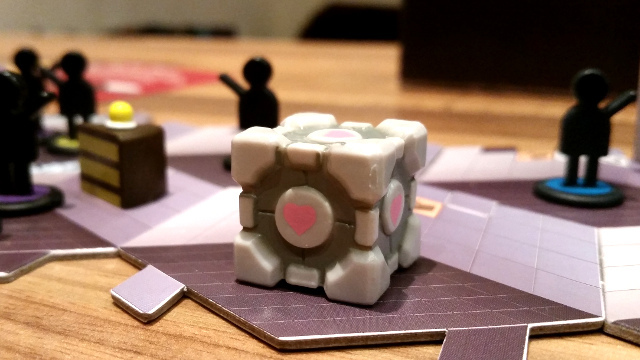 I like Portal and I like the way the game plays, which I suppose is the important bit. It’s not overly long either – perhaps 45 minutes. But the price for the box contents – the value for money – leaves a lot to be desired. I paid a little over £35 but it was as much as £58 at times. Even for the price I paid I feel it was overpriced – or under-presented, which I feel is a betrayal of the source material because Valve have always been a bastion of value for money and high quality games. It’s like we’ve been shown a dream holiday in a brochure, but when we get there, the “sandy beach” is a building site in Bognor and the “5-star catering” is a ropey kebab van outside the local night club accompanied by a few ladies of negotiable virtue. You’re going to have a good time, but it’ll leave you with a bad taste in your mouth.